Chico Cheer All Stars was formed in the spring of 2006 as a result of the overwhelming need for an All-Star Cheer program in Northern California. The program founder is former Chico State and Chico High cheerleading coach Tiffany Hayes. 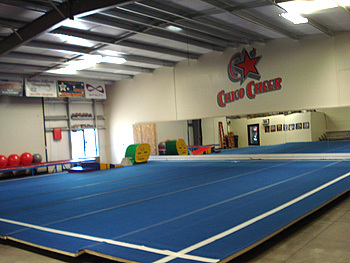 With such a high demand for a training center for cheerleaders north of Sacramento, Tiffany linked with Oroville gym owner and elite gymnastics coach, Shaw Carter, to create a facility to house the Chico Cheer All Stars for the first 3 years of business at Oroville Gymnastics Sports Academy. With a successful beginning Tiffany and the staff of CCAS decided to open the first cheerleading gym in Chico to serve the cheerleading community and help train cheerleaders and tumblers the same way they were trained. Chico Cheer All Stars new gym opened in Chico on July 11th, 2009. With the completion of the newly renovated facility, it is easy to see why cheerleaders from all areas come to train with Chico Cheer All Stars. With such an incredible staff, and a specialized cheerleading facility, we invite you to stop by and see what Chico Cheer All Stars can do for you! COME SEE OUR BRAND NEW facility in the same great location in Chico, located off Cohasset Rd. We offer 4,200 sq. feet exclusively for cheerleading and gymnastics training! Including a 7 panel carpet bonded cheerleading floor, the FIRST Xtreme Tumble Track in the U.S. (brought in from the 2012 Olympic Trials in San Jose), a fully loaded sound system, full mirrored facility, and assorted mats for all tumbling purposes. The reception area offers a full Pro Shop for all your practice wear needs. The parent viewing area is spacious and provides seating for all views of the gym allowing friends and family to view practice and/or events at all times. Are gym is perfect for special events. Contact us today to rent the only cheerleading and gymnastics gym in Chico for your next practice, camp, event, or birthday party! - Turn right on THORNTREE DR.
- Turn left on CABIN HOLLOW CT.
Tiffany has over 20 years experience in the cheerleading industry, including her time spent with the North County All Star Bullets, Chico High School (4 years) and California State University, Chico (3 years). She has been involved in All Star cheerleading since 1995. Tiffany holds current UCA and ACCA certifications, as well as a master's degree in Nutrition Education. Tiffany is USASF certified for levels 1-5. Erin and her family have been part of the Chico Cheer family for years. She helps run our front desk/office and Pro Shop. She also does all class and team registrations, in addition to collecting all athletes payments and paperwork. She is CPR and First Aid certified. Joseph has over 10 years experience in the cheerleading industry, including his time spent with the Chico Cheer as an athlete (5 years), Steven F. Austin University on Large Co-ed (3 years), and coaching American Cheer All Stars (2 years). Joseph holds current certifications, as well as a bachelor's degree in Event Planning. Keneisha has 12 years of experience in the cheerleading industry. She is a former high school and college cheerleader. Keneisha is a Chico Cheer alumni and a three time international champion. She cheered all four years of high school on the sidelines and competitively, as well as competing in college on a competitive STUNT team. She is CPR and First aid certified. Jordan has 12 years of experience in the gymnastics and cheerleading industry. She is a Chico Cheer alumni and has competed at the Cheerleading World’s, Summit and NCA Nationals in Dallas and is a two time UCA National champion. Jordan is CPR and First Aid certified. Danny has 6 years of experience in the cheerleading industry, he has been a high school and college cheerleader, and he also has experience as a former coach. Danny has coached for Orland Pop Warner Cheer, Butte College Cheer and is the current Chico High School Cheer Coach. He is an Orland High Cheer alumni, where he cheered on the sideline team and competitive team. Danny is CPR, First Aid and ACCA certified.